Coated With Fur is a series of books based on Dr. Nelson's experience at the Minnesota Veterinary Center located in Burnsville, Minnesota. The series starts with Coated With Fur: A Vet's Life with a dog who had been hit by a car and needed emergency treatment to save his life. The second book, Coated With Fur: A Blind Cat's Love stars many characters from the first book as well as introducing a new clinic cat named Radar. Dr. Nelson is currently working on the third book in the series, Coated With Fur: A Vet's Heart. If all goes well, there will be nine books in this series. 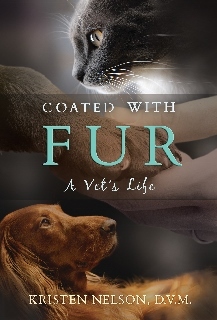 Coated With Fur: A Vet's Life is available in hardcover and paper back at bookstores nationwide as well as Amazon. 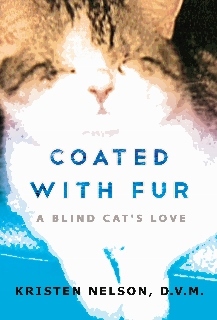 Coated With Fur: A Blind Cat's Love can also be purchased in hardcover and paperback at Amazon. Electronic versions are available at Amazon for the Kindle and Smashwords for all electronic formats. Set in a Minnesota veterinary practice, Coated With Fur: A Vet's Life is Dr. Nelson's first book. It chronicles a young woman’s experience as the owner of a start-up clinic. Experience the joy of saving a dog’s leg to the agony of losing a patient. Feel your heart race when a snake gets stuck, scaring the society ladies in waiting room. Through it all, experience the unconditional love that exists when we open ourselves to the wonders of the human-animal bond! challenges of being a veterinarian. The third book in the Coated With Fur series, picks up with Dr. Nelson treating a puppy with a fractured leg and a ferret with life-threatening pneumonia. This book is progressing slowly because Dr. Nelson is in full time clinical practice at Arizona Skies Animals Hospital. She is currently working on chapter 5.